When Watt Sriboonruang arrived in the United States in 2005, she worked as a photographer for local New York City restaurants and often traveled the world on freelance photo assignments for luxury brands like Coach. But whenever she missed her home country, she turned to two pastimes to reconnect with her native Thailand: food and fighting. Her second newfound pastime involved a bit more grit. She explored various mixed martial art gyms throughout NYC to practice Muay Thai, a combat sport originating from Thailand. She eventually found her homebase at Kings Thai Boxing in Midtown Manhattan and began to compete in the amateur circuit. She genuinely enjoyed the art of Muay Thai striking, but while the sport itself was fun and exhilarating, cutting weight to qualify for certain fight divisions was not. To prep for her fifth fight in 2012, she tried a vegan diet. Not only was she able to cut weight effortlessly without feeling weary or hungry – but felt more energetic and fulfilled than ever. She stuck to the plant-based diet but admittedly missed indulging in desserts, which are often packed with dairy. After experimenting with some ingredients, she started Rawsome Treats, a line of vegan pies that are entirely raw, plant-based, gluten-free and paleo-friendly. Instead of using refined sugar for sweet fillings, she turned to agave, cacao nibs, coconut oil and dates. Instead of flour and wheat, she formulated pie crusts made of crushed cashews, pecans and young coconut meat. First she began sharing slices with fellow fighters as she understood the pain of being on a restrictive diet. “They’re so grumpy and hate the world because of the intensity of fight camp,” says Sriboonruang. “When you share the same pain and happiness with your customer — that’s a bond.” She adds that it’s crucial for new small business owners to find a similar bond with customers. Next, she began marketing and selling at other MMA gyms, and even set up a pop-up stand ringside at Friday Night Fights, a promoter and producer of Muay Thai fight events. Soon her products garnered a following among professional and amateur fighters, competitive athletes and other health-conscious gym-goers. She says serving this ultra-niche community helped her build a loyal following of repeat customers, who also helped her grow by word-of-mouth. “A lot of people suggested I sell at these fights but I thought attendees would crave pizza and beer. But when I completely sold out at my first event I learned the power of having a physical presence and connecting directly with customers.” It’s also where she met her first wholesale customer, a plant-based Mexican restaurant in Brooklyn called Jajaja Plantas. She soon realized she wanted to pursue her vegan dessert business full-time but for her to succeed, she had to expand beyond her customer base of competitive fighters and reach a broader audience of vegans and foodies. In 2013, she launched a website that delivered pies throughout the city. She initially built her business on raw creamy fillings comprised of fruits like lychee, persimmons and of course, coconut. Then she got more creative. She whipped up new menu items titled Matcha Cream Crunch (made of green tea powder), tiRAWmisu (made of espresso beans and Irish moss) and raw Red Velvet (made of beet juice and berries). The fresh products brought an array of color to her online store and made her social media accounts more eye-catching, amassing more than 13 thousand followers on Instagram. She also partnered with several restaurants throughout the area – from vegan eateries like Green Street (a paleo-Korean restaurant), to non-vegan restaurants like Bistango (a traditional Italian restaurant). “Along with the increase in wholesale business, we were getting a lot of requests for retail. We thought it was best to combine the two and open up a retail space with capacity big enough to grow both sides of the business,” says Sriboonruang. 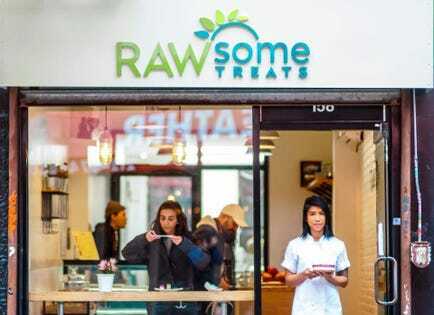 After two years of hunting for an affordable yet functional space in New York City, she pooled $200k in personal capital, and in April, opened Rawsome Treats in the Lower East Side in Manhattan. In addition to paying rent for a humble space with a ground floor of 400 square-feet, her biggest expense was purchasing a massive industrial-sized freezer that takes up 120 square-feet of the shop’s basement. After less than eight months since the grand opening, her shop is resonating among locals and tourists, and expects to pull in between $150,000 to $250,000 in revenue for 2018. But the former Muay Thai fighter is taking on new challenges as a new brick-and-mortar business owner. When Rawsome was just an online company, she ran the business with just her husband, Chris, and only had to hire two part-time employees for deliveries. Since opening the bake shop, she now manages a team of six full-time employees. “The biggest lessons have been in hiring,” says the dessert chef. “We operate in a small space and spend more hours together than our actual family. To train and hire the right people who are skilled to create artistic desserts is one thing,” says Sriboonruang, “but to find people who are passionate about plant-based life and can work in a demanding small business environment is another.” But she says so far, she has learned a solid employee is always worth fighting for.